If you are looking for a more compact solution than an upright carpet washer then it is worth considering a handheld carpet cleaner. 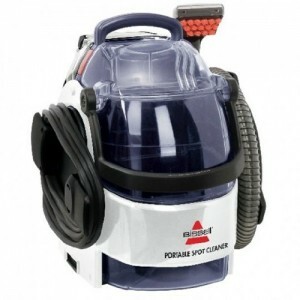 While not as small as a handheld vacuum cleaner they are considerably less bulky, and therefore lighter, than their upright equivalents. 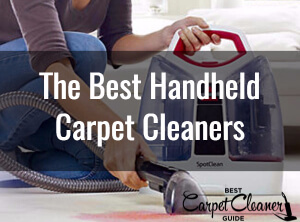 The great thing about hand held carpet cleaners is that you can store more easily; and these means you can access quickly when you need in an emergency! Bissell pretty much has the compact and handheld carpet washer market to itself as there are no equivalent models from Vax. There are two portable models in the Bissell range, the Little Green and the slightly more expensive Homecare Emergency Spot Cleaner. Plus, there is also the 2-in-1 Bissell CleanView Lift Off carpet cleaner. The Little Green is a compact carpet washer, but bear in mind that this is relative to bigger upright cleaners so it’s not as small as, say, a handheld vacuum cleaner. Weighing in at 4.6kg, the Little Green is considerably lighter than a lot of the upright carpet washer models (about 50% lighter) but is very close to the 5.5kg weight of the upright Bissell CleanView QuickWash. The motor in this Bissell is 300-350watt, so although lower than some of the more powerful (and expensive) carpet cleaners it is still comparable to the power of the Bissell CleanView QuickWash & CleanView Reach models and the Vax Rapide Deluxe. The water tank on the Little Green has a capacity of 1.4 litres, so while lower than an upright washer, it’s still enough for emergency and spot cleaning use. The hose on this model is 1.35 metres so you can put the main unit on the floor and clean the nearby carpet area without having to move the unit too often, although it will require more movement when using on stairs. The handheld cleaning tool has three rows of small brushes and its compact size makes its great for cleaning upholstery, stairs or your car seats. 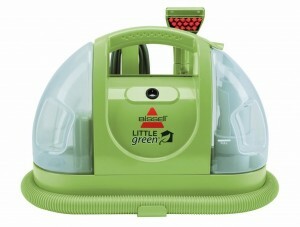 Do we recommend the Bissell Little Green? Well it really comes down to how you intend to use it. There are cheaper upright carpet cleaners available so the Little Green is more suited to emergency and spot cleaning duties. It’s ready-to-use and can be stored more conveniently than conventional models. As a compact hand held carpet washer though, it does the job very well. 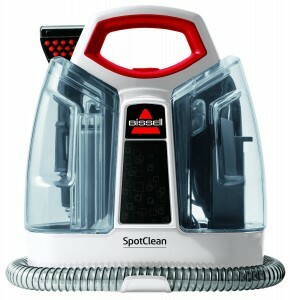 The Bissell Emergency Spot Cleaner has the same design principles as the Little Green – that is, the motor unit and attachment holder are in the middle and the clean and dirty water tanks on either side. Size wise, the Emergency Spot Cleaner has similar dimensions to the Little Green but a slightly lower weight of 3.9kg. The recommended retail price of the Emergency Spot Cleaner is around £30 more than the Little Green but is often discounted to around £20 more. So what do you get for this increase in price? 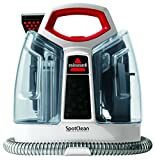 As well as adding hot water and cleaning solution to the cleaning tank, the Spot Cleaner also allows you to add the Bissell Oxygen Boost cleaning solution for better removing of stubborn stains. The main difference though is the addition of Heatwave Technology that heats up the cleaning water. This ensures the cleaning solution is always warm and this again provides better cleaning performance. The clean water capacity of the Emergency Spot Cleaner is slightly less than the Little Green at 1.1 litres but still enough for those emergency cleaning duties. The cleaning head on this model is also near identical to that of the Little Green, with three rows of small brushes. However, the hose on the Spot Cleaner is slightly longer at 1.5 metres. In our opinion, the Emergency Spot Cleaner is also a more modern and better looking machine than the Little Green. It also has the inbuilt heater and the ability to use Bissell’s Oxygen Boost formula. The cost difference versus the Little Green is often minimal (when discounted) so we would recommend choosing the Emergency Spot Cleaner as long you can find at a good price! If you are looking for a portable carpet cleaner and can stomach the price tag, then the Bissell Lift Off could be for you. The great thing about the Lift Off is that it’s a 2-in-1 carpet washer. 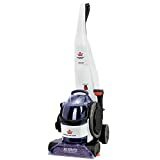 Basically it can be used as both an upright carpet cleaner or the cleaning unit can be detached so it can be used as a portable compact cleaner. Yes, it’s not as easy to store as a compact handheld cleaner but you still get the benefits of a portable cleaner while retaining the whole room cleaning ability of an upright cleaner. As a top-end carpet cleaner, the Lift Off comes packed with features. The base unit has 2 rows of rotating brushes that get deep into the carpet fibres for a better clean. The clean and dirty water tanks both have a large 2.5 litre capacity and an on-board heater will keep the cleaning water and solution at the right temperature for best cleaning results (the heater can also be turned off for use on delicate carpet or rugs). The hose length is 1.5m metres which is a similar length to Bissell’s other portable carpet washers, so it can be used on stairs but will require some lifting and carrying of the portable Lift Off unit. The hose attachment also includes a hand tool with three rows of brushes. 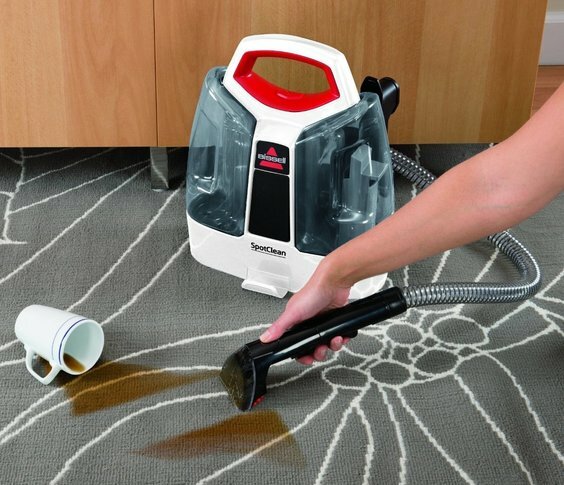 This model also features Bissell’s Microban anti-bacterial filter technology that helps prevent the bacteria building up and also helps remove unpleasant smells (this feature is not available on Bissell’s other portable carpet cleaners). The motor power output is rated between 800-1000 watts so certainly not the most powerful machine and this is the comprise you make when having a 2-in-1 machine. Although the Bissell Lift Off has a retail price of £400 it can often be discounted and at lower prices it becomes a very attractive option for someone looking for an upright carpet cleaner plus the versatility of a portable unit.